If you’re involved in trying to support change in an organisation, or within society, you may find yourself talking about ‘the system‘. Here are a few words about how I understand ‘the system’. Lets start somewhere simple – with what ‘the system’ isn’t. In this context ‘the system’ isn’t the people in charge, men in grey suits, the government, capitalism, the director of the organisation, or the senior managers. There’s a bigger debate to be had about each of these things and social/organisational systems – but rather than having this now, stick with me and you’ll see what I’m getting at. 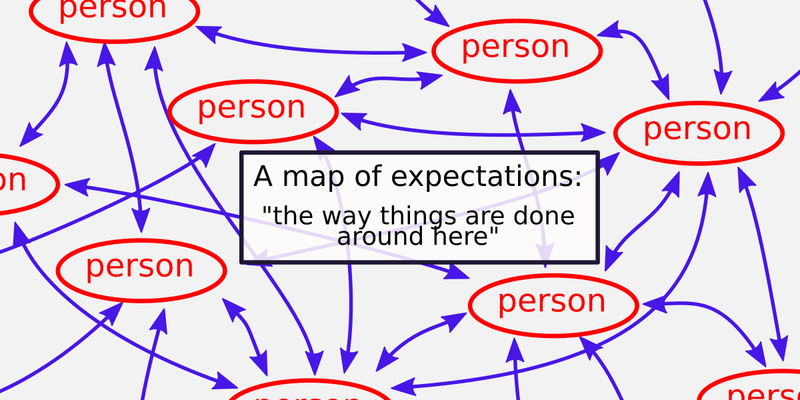 Many people start from the assumption that ‘the system’ is one of those things, but a better way to understand ‘the system’ is that it is ‘the way things are done around here‘. To explain with an example: In the UK a majority of parents tell their children about Father Christmas / Santa Claus. I should be clear that I’m aware that the Santa story isn’t common to all communities – some will have positions on Santa based in religious convictions – but there will be many equivalents to the Santa story which this article could just as well refer to. Imagine that you are the parent of a young child who is just being introduced to Santa. Imagine you have come across research proving that children are psychologically damaged when they find out that this is just a story. You decide that Santa will play no part in your life – and in fact that you will tell your child that he doesn’t exist. Surely this should be a simple matter? After all as the parent you have a huge power over your children. No problem then? But in most communities you’ll probably think twice. Your friends and family are likely to see your action as cruel. Teachers at your child’s school will find it awkward to know how to handle them at Christmas. Other parents may not invite him/her to their house in case their own child gets upset. Your child may end up isolated. What does this tell us about what ‘the system’ is? The system can be thought of as ‘the way things are done around here’, and telling the Santa story to our children is, for most communities, ‘the way things are done around here’. Not telling this story (or telling the truth) would be to step out of line. Stepping out of line has consequences – and they are negative ones. To understand this further it is helpful to ask who is in charge of the Santa/Father Christmas idea? Who should a concerned citizen write to? Could the government do something? What about the Queen or the President? I don’t think that any of these people have the power to banish Santa. Santa would simply go underground. This example provides an initial indication of why certain changes are difficult to implement, but the key to a deeper understanding is to take note of one of the most surprising behaviours of any human system. Sometimes it seems that ‘the system’ is actively opposing our efforts to change things. We can almost imagine that there is a conspiracy against us even though we know there isn’t. At first encounter we might put this thought aside as paranoia. If ‘the system’ isn’t anything organised, but just an effect arising from the interactions within a network of human beings, how can it oppose us? We’d expect to encounter individual people opposed to what we’re doing, but how can it be that the opposition feels more coordinated, more organised? Well the study of human systems actually supports the idea that such things can arise from the interactions of individuals. The idea of ’emergence’ refers to the behaviours of a system that seem to make more sense at a system level than when looking at individual elements of the system. The idea of ‘collective intelligence’ refers to the problem solving abilities of a group of people or organisms – when looking at this at the level of the group. Emergence and collective intelligence are behaviours that the system as a whole exhibits as a result of the huge number of interactions between individual parts of the system. The arise from the network of people at the system level. To give a real example: an ant colony, when migrating, may choose the best from a set of available new nest sites. This doesn’t sound like a particularly odd idea until we realise a number of things about ants. Firstly, no single ant has (in all likelihood) the ability to analyse and compare new nest sites in any depth. Secondly, there is no super-ant or ant-committee or ant-government that collates information – and no way for individual ants to communicate to such a committee/ant. The ‘queen’ ant, despite common perception, does not do this. So how can it possibly be then that a colony of ants make a choice like this? The point is that nest choosing is a behaviour of the system as a whole. The choice of site can take place despite no one ant knowing about the existence of more than one new nest site. This effect is nothing more than the result of the sum of the behaviours of many individual ants, and it is actually reasonably easy to explain. Curious readers might do worse than to start with looking up Deborah Gordon’s work with a simple Google search. Emergence and collective intelligence aren’t mysterious effects – they are quite easy to understand in theory – but in reality these things can certainly be surprising. Human systems work the same way. The system has behaviours that can more usefully be understood at the system level than by looking at the behaviour of individual people. An active opposition to certain types of change is one such behaviour. Understanding ‘the system’ in this way isn’t just an academic exercise. It helps us to think about more effective strategies for generating change, and to anticipate the nature of the difficulties we will encounter. The starting point is simple. We need to learn to work with the idea that ‘the system’ has the capacity to oppose change. We need to learn that the response of ‘the system’ isn’t something we can predict from understanding the attitudes of individual members of it. We need to learn that the battle isn’t over just because we have the support of senior people, the government, or any other individual human beings – not even the men in grey suits. What does the system want to happen here? How will the system oppose us? How can we be a step ahead when the system responds to our efforts? Can we keep our change efforts ‘below the radar’ so that the system is less able to respond? How might we make it in the interests of the system to adopt a new ‘how things are done around here’? “We can’t do it ourselves” – a helpful (more academic) article by Kris De Decker which illustrates the differences between ‘behaviour change’ work (focused on individuals) and ‘social change’ work (focused on a society). The remarkable thing is that the opposition doesn’t even need to become ‘organised’ as you put it. The ants prove that even unorganised behaviours – in the sense that nobody is coordinating – can create powerful effects. Indeed this uncoordinated opposition can be the most effective by far. Individual actions of individual people, and individual arguments, may not individually stand as high a chance of success… but somewhere or other if enough people (with enough energy) are involved, or enough time elapses, then one of the arguments or tactics will prove effective. The argument does not need to be logical. The facts don’t need to be correct. The tactic doesn’t need to be fair. All that matters is that something effective has happened – something that has an effect in undermining what we’re working for. And the uncoordinated and therefore flexible opposition can pile in behind that argument or tactic. Fact, logic and reason then don’t work very well to patch the hole in our defence. As this isn’t a coordinated thing there is no one person or group to fight with the fact, logic and reason. If we want to use fact, logic and reason to patch the hole then we need to convince a disparate and uncoordinated group of people that they are wrong, which is of course very difficult. And of course many of those piling in behind the argument or tactic probably already know that the facts are suspect, the logic twisted, and the tactic unfair. So how is fact, logic and reason going to work for us as a defence?